It doesn’t matter how long it will take. You’ll get the project done. It doesn’t matter what time of the day it is. You’ll work until you get it right. You have — what I call — a “do-whatever-it-takes attitude.” It’s because you’re a writer and you possess an unbridled enthusiasm for creating. You should be proud of that, but you also might be frustrated because it’s tough to find a career that requires and appreciates your writing skills and creative abilities. It’s going to be okay, though. That “do-whatever-it-takes attitude” of yours will motivate you to continually sharpen your strengths and lead you to opportunities that are the right fit. 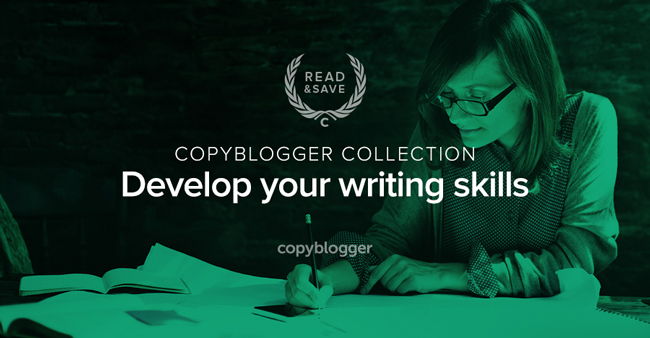 As you work your way through the material below, think of the following lessons as a mini course for writers looking to become content marketers. Change is scary, so it’s common to also fear the exact thing you want. Because you must evolve to get there. In How to Immediately Become a More Productive (and Better) Writer, Jerod Morris wants to help you along your evolution as a writer who is content marketing savvy. “I want to help you change as a writer — in one small but significant way. Check out Jerod’s guidance and then decide on a small step you can take today. Web writing requires specific knowledge, and there’s no better person to prime you on all the details you need to learn than Demian Farnworth. You’ll even find The Perfect Anatomy of a Modern Web Writer a lot more entertaining than your high school biology class. Demian walks you through categories such as research aptitude, usability awareness, and even caffeine appreciation. But we make a great team and both want to create the best content we possibly can. I was delighted when Demian decided to write 6 Simple Exercises to Help You Write Better Short Sentences. “Short sentences are gospel truths when it comes to clear, concise writing. Yet, instructions on how to actually write short sentences are in short supply. I aim to fix that. We also created a free worksheet you can download to help you practice. You can love where you are today and still strive to expand your world. It keeps things exciting. Use this post (and save it for future reference) when you’re ready to put in the time and effort that will help you become the writer and content marketer you want to be. Thank you Stefanie. I have just read the first one by Jerod Morris. Stunned by what he says regarding adverbs, so I will read more on the subject. I will check out the other two links soon. People have mixed opinions about adverbs. I like using them, but Jerod makes a great point. It’s important to understand that they can weaken your writing in some cases. Having that awareness is helpful. This is an amazing resource. Starting with the productive aspect, most writers don’t measure their writing and its impact. I read the article to become a better writer and it is a semi-reflection on me and semi-path opener to me. I have got work to do. Elimination adverbs, adding small improvements and simply writing (not blogging) opens up doors for becoming better. Thanks for this resource, I read the web writer anatomy and I am glad I have enormous improvement areas. I do have basic understanding of SEO and usability however I lack understanding and time to spend on social media. I am experimenting on twitter as of now. It is cool to see these elements in a web writer. Copywriting- is something I am practicing and learning from Copyblogger, Ramit Sethi’ blog and few others. Seeing is half learning for me. Story telling is little weak of mine, it is getting better day-in and day-out. This anatomy can be used as a roadmap to become an excellent web writer. PURE GEM. Shorter sentences are better. The worksheets are awesome. Some of them were new to me. Writing in fewer than 100 words. Incredible article. The idea is to learn, work and re-learn. Being a web writer is a challenging thing. To be frank, everything you want to achieve should be little challenging. It indicates you are growing. Growth is the fundamental option for us. We should mark the check box. We have the right to evolve, take notes and work to become better. From writing rants to writing poems to thought provoking articles, the journey have been amazing for me. Learning never stops. Stefanie loved your write up…Stay awesome!!! Thanks for diving deep into all the material, Rohan! I’m glad you find it useful! All 3 articles were awesome. Perhaps the first one helped me the most today. Sometimes I do need more time to get a project done. It happens when I run out of ideas and inspiration. I was glad to discover that I write, not blog. I do my research, take notes, sketch a plan to outline my general idea and then start writing. I do the editing later. If I edit as I write, I risk of losing my thoughts. I believe that a proven way to improve your writing as well as expand your horizons is by exploring famous writers. Thankfully, there are plenty of great modern writers we can learn so much useful practices and techniques. Stephen King’s On Writing is the writer’s Bible for me. Another author I also find awesome is Daniel Coyle. His work The Talent Code is insightful and worth reading over and over again. These were some great tools to use as a writer. The nice thing about them is that they can work for content writers and other freelance writers as well. Thank you for sharing them! Thank you for checking them out, Robert! Hey Stefanie, How are you today? This is a very valuable post that I think many people can relate too. I have been blogging for only a matter of months now and sometimes I get very unproductive, damn facebook haha. We all need to find ways to be more productive and find more time for the things we need to do and there is some great information in this post to help with that! As, usual here at copyblogger, an excellent article but excellent writers! Thanks for stopping by and reading, Shaun! We’re happy to have you here! OMG, thank you so much I have dying for a blog like article like this to come out, very helpful! Great article. personally I saw that, “Short sentence” helps to increase copy score on Yoast seo plugin. Short, clear sentences that pack a punch. Very helpful! Thanks fo putting this together. There is a ton of advice about online writting it is hard to cut trough all the noise. I especially appreciate short sentences tips. It makes all the difference between easy to read posts and unusable wall of texts. You can see by my comment that I need a lot of help wit this :).